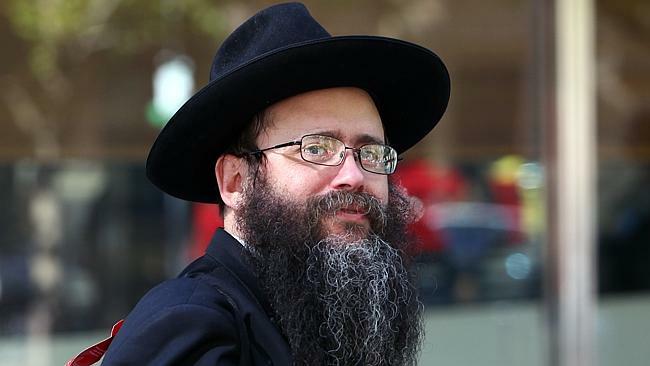 Rabbi Yosef Feldman leaves the Royal Commission into child sexual abuse in Melbourne (photo: News Corp Australia). A VICTIM of child sexual abuse perpetrated by two members of the Yeshivah community has described the ultra-orthodox leadership culture as “rotten to its core”, after learning a senior rabbi described him as an “informer” with no contradiction. The Royal Commission into Institutional Responses to Child Sexual Abuse is currently examining the response of the Chabad Yeshivah Centre and school in Melbourne as well as its counterpart in Sydney after the abuse committed by three convicted pedophiles became known, amid accusations of widespread cover-ups. A man known by the pseudonym AVB, who was abused at Yeshiva College in Bondi and by a Yeshivah Melbourne staff member, told the commission he was stunned to learn this week that Sydney Rabbi Yosef Feldman had described him as a “moser” to other rabbis and met no argument. A moser is a Jew who informs on another Jew to secular authorities, according to the historical Jewish practice of mesirah. He said family ties within the Chabad community created deep-seated conflicts of interest which fostered a “corrupt system”, demonstrated whenever complaints arose against the leadership. AVB called for Rabbis Boruch Lesches, Pinchus Feldman and Abraham Glick, and other Chabad leaders who were in place at the time of the pedophiles’ offending, to resign their positions at Jewish organisations relating to children. “There is a lot of hurt from these events and ultimately someone has to stand up and accept responsibility,” he said. “Either they do it of their own accord or it is imposed upon them. AVB said he had often wondered whether he made the right decision coming forward as a victim of sexual abuse, because of ostracisation he and his family had faced in the Chabad community.